Hi readers. Sorry for being MIA this past week. Busy, busy, busy. Last weekend, during the sub-30 degree weather, Dan and I hosted his parents for a winter luau dinner party, which we had given them as part of their Christmas gift. 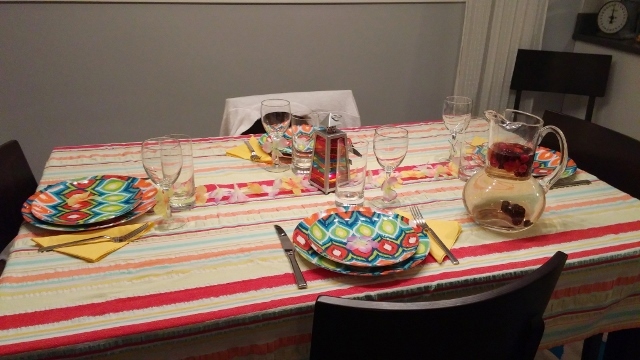 As I’ve blogged before (here and here), I host a luau for my girlfriends every year. That made decorations easy, as I just hung a few Hawaiian inspired items on hand, like cutouts of hibiscus flowers and tiki men, around the house. For the table setting, I used our outdoor melamine plates and a broken lei’s flowers to scatter on a summer tablecloth. The menu was simple. 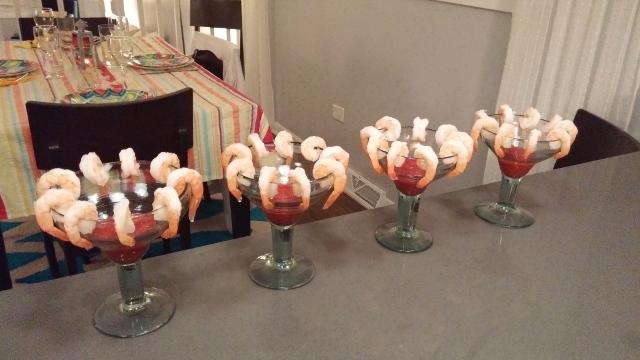 To start, we served individual shrimp cocktails in margarita glasses and my mother-in-law’s delicious sangria. Our main course consisted of a romaine salad with bacon and pineapple, baked sweet potato fries, and ham and swiss sliders served on Hawaiian rolls. No photos were taken – the food disappeared too quickly! 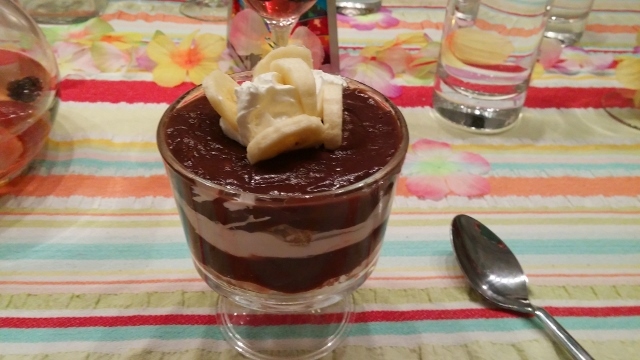 Finally, for dessert, we served Hawaiian trifles – banana cake, chocolate pudding, and Cool Whip, topped with fresh banana.